Which part of $939,000 Northport house was built in 1904? Half of this $939,000 Northport Colonial was built in 1904 and the other half was added in 2003, says the property's listing agent. 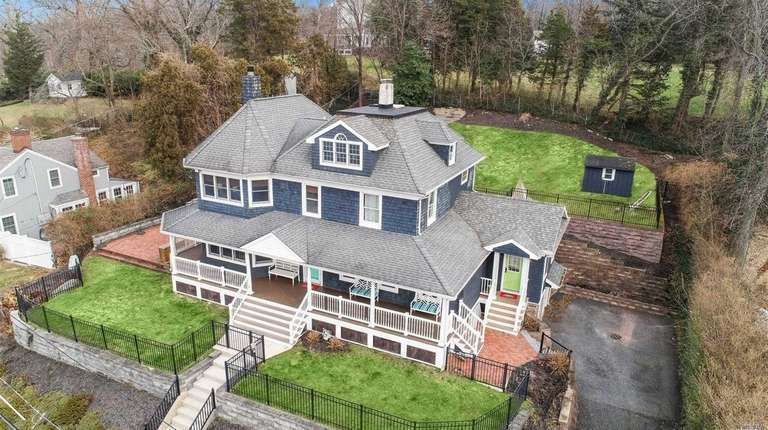 The four-bedroom, three-bathroom house, which sits on a 0.35-acre property offering views of Northport Harbor, was originally owned by a member of the Fox family that the street is named after, Petronella says. The side of the house from 1904, with updated plumbing and electric, includes a living room with original wood floors and pocket doors that open to a dining room with coffered ceilings and a built-in plate rack. The 2003 extension added a breakfast area with French doors, and an adjacent family room with a gas fireplace, wall-to-wall windows with views of the harbor, and wood floors that match the original on the opposite side of the house. Directly above the family room, also added on in 2003, is a master bedroom with vaulted ceilings, a roughly 6-foot-by-12-foot walk-in closet and a full bathroom. The upper level also has three additional bedrooms and a bathroom. The house, which includes a main level office and mudroom that were added in 2012, features a walk-out finished basement with French doors and a 15-foot-by-25-foot room with water views. A covered, wraparound porch with water views stretches to a brick patio off the kitchen.